Hundreds of objections and a fervent, angry crowd in attendance failed to divert a majority of councillors from giving the go-ahead to controversial plans on the County Hall site. At this afternoon’s meeting of Northumberland County Council’s strategic planning committee, members voted – nine for, including all of the Labour councillors, and five against, including all of the Conservative councillors, in each case – to approve three separate applications for a new first school, up to 200 homes and a retail development. However, for all three bids, the committee is only minded to approve the applications, subject to a decision on whether the Secretary of State will call them in, meaning it might not the be the end of the story yet. The outline housing scheme, to include the demolition of County Hall, and the retail development were the most opposed aspects, but even the school plan sparked objections to what critics described as the lack of an appropriate masterplan for the area. Up first, the decision on the new Morpeth First School, to replace Goosehill, was preceded by a impassioned plea from the headteacher Elaine Reay, who is desperate for a modern facility to replace the 106-year-old building which currently houses the school. “We don’t want it delayed for any reason,” she added. The indicative layout for the housing bid shows 177 three, four and five-bedroom homes on the site, which would take up land needed for any development of a Stobhill link road. At the meeting, objectors’ main concerns focused on how the ‘rushed’ (refuted by the council’s head of planning) application was contrary to the Morpeth Neighbourhood Plan, which Coun Nic Best, of Morpeth Town Council, described as a ‘tried and tested vision of the local community’. This criticism applied to all three of the applications to a greater or lesser extent. The proposals for a food store, retail units, pub and drive-thru restaurant on the former fire station and Merley Croft sites sparked additional fears about the impact of an out-of-town development on the town centre. 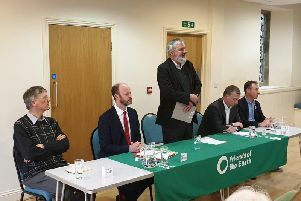 As it continued, the meeting became more heated when a Morrisons representative interrupted from the back as Coun Scott Dickinson asked questions of the planning officers about the possible impact on the supermarket before this third approval was greeted with cries of shame and other angry comments from the public. Speaking afterwards, David Holden, chairman of the South Morpeth Coalition residents’ group, said: “I have formally complained to the council that the plans have been given undue priority to meet a timescale driven by the council’s interest as landowner, information has been posted on the planning portal that has been confusing, misleading or incorrect, and that Morpeth residents have received countless letters which have been impossible to follow.